More efficient logistics processes with FleetBoard Logistics Management. 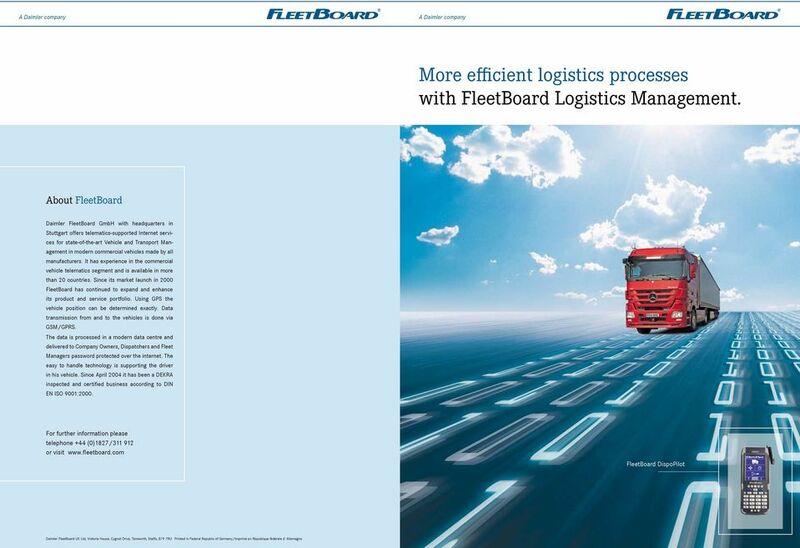 Download "More efficient logistics processes with FleetBoard Logistics Management." 2 A clear path for your fleet. 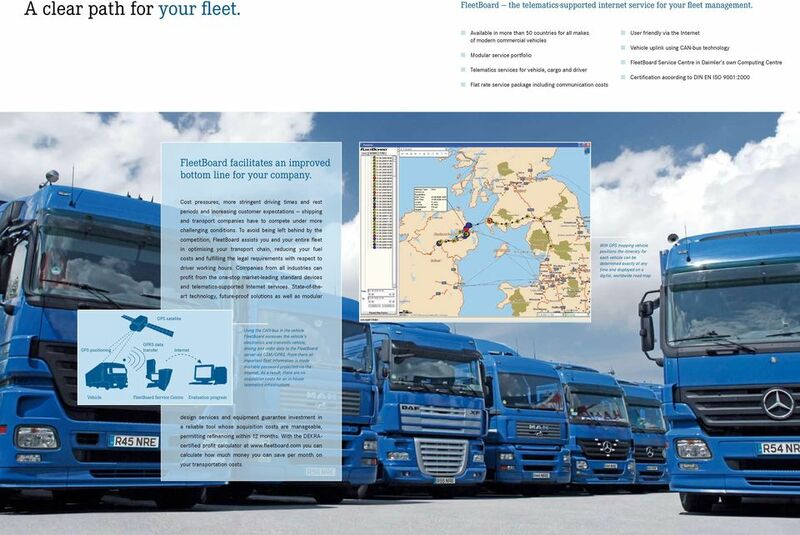 FleetBoard the telematics-supported internet service for your fleet management. Available in more than 50 countries for all makes of modern commercial vehicles Modular service portfolio Telematics services for vehicle, cargo and driver Flat rate service package including communication costs User friendly via the Internet Vehicle uplink using CAN-bus technology FleetBoard Service Centre in Daimler s own Computing Centre Certification according to DIN EN ISO 9001:2000 FleetBoard facilitates an improved bottom line for your company. Cost pressures, more stringent driving times and rest periods and increasing customer expectations shipping and transport companies have to compete under more challenging conditions. To avoid being left behind by the competition, FleetBoard assists you and your entire fleet in optimising your transport chain, reducing your fuel costs and fulfilling the legal requirements with respect to driver working hours. Companies from all industries can profit from the one-stop market-leading standard devices and telematics-supported Internet services. State-of-theart technology, future-proof solutions as well as modular With GPS mapping vehicle positions the itinerary for each vehicle can be determined exactly at any time and displayed on a digital, worldwide road map. GPS satellite GPS positioning GPRS data transfer Internet Using the CAN-bus in the vehicle FleetBoard accesses the vehicle s electronics and transmits vehicle, driving and order data to the FleetBoard server via GSM/GPRS. From there all important fleet information is made available password-protected via the Internet. As a result, there are no acquisition costs for an in-house telematics infrastructure. Vehicle FleetBoard Service Centre Evaluation program design services and equipment guarantee investment in a reliable tool whose acquisition costs are manageable, permitting refinancing within 12 months. With the DEKRAcertified profit calculator at you can calculate how much money you can save per month on your transportation costs. 4 Professional support for the driver. On time at the destination. 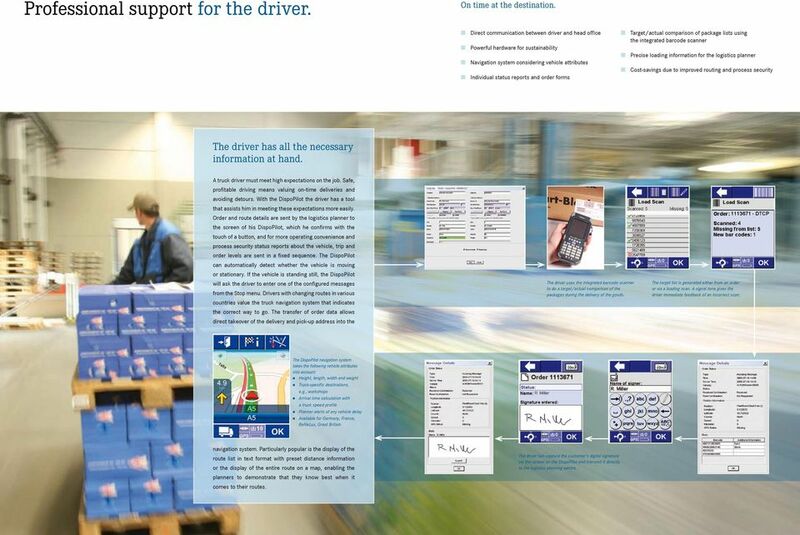 Direct communication between driver and head office Powerful hardware for sustainability Navigation system considering vehicle attributes Individual status reports and order forms Target/actual comparison of package lists using the integrated barcode scanner Precise loading information for the logistics planner Cost-savings due to improved routing and process security The driver has all the necessary information at hand. A truck driver must meet high expectations on the job. Safe, profitable driving means valuing on-time deliveries and avoiding detours. With the DispoPilot the driver has a tool that assists him in meeting these expectations more easily. Order and route details are sent by the logistics planner to the screen of his DispoPilot, which he confirms with the touch of a button, and for more operating convenience and process security status reports about the vehicle, trip and order levels are sent in a fixed sequence. The DispoPilot can automatically detect whether the vehicle is moving or stationary. If the vehicle is standing still, the DispoPilot will ask the driver to enter one of the configured messages from the Stop menu. Drivers with changing routes in various countries value the truck navigation system that indicates the correct way to go. The transfer of order data allows direct takeover of the delivery and pick-up address into the The driver uses the integrated barcode scanner to do a target/actual comparison of the packages during the delivery of the goods. The target list is generated either from an order or via a loading scan. A signal tone gives the driver immediate feedback of an incorrect scan. The DispoPilot navigation system takes the following vehicle attributes into account: Height, length, width and weight Truck-specific destinations, e.g., workshops Arrival time calculation with a truck speed profile Planner alerts of any vehicle delay Available for Germany, France, BeNeLux, Great Britain navigation system. 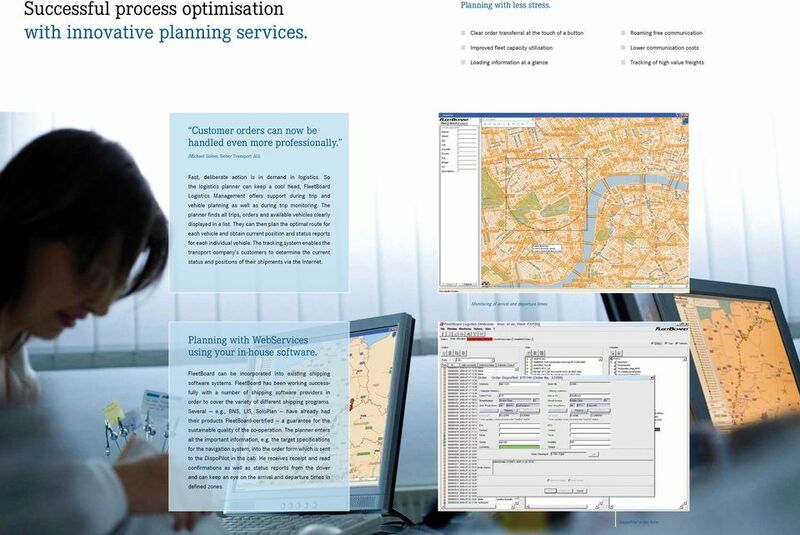 Particularly popular is the display of the route list in text format with preset distance information or the display of the entire route on a map, enabling the planners to demonstrate that they know best when it comes to their routes. The driver can capture the customer s digital signature via the screen on the DispoPilot and transmit it directly to the logistics planning centre. 5 One contract, one price, countless savings potentials. Logistics Management service package. Route planning and monitoring Mapping Order management Barcode scanner Digital signature Truck navigation system WebServices Order Management Time Management Navigation FleetBoard DispoPilot. Suitable for all trucks. Suitable for all commercial vehicle brands. Protected against dust, moisture and drops 2D imagery for the barcode scanner Internal 2 GB memory card Truck navigation Digital signature Touchscreen operation Remote update Prerequisites for the utilisation of the FleetBoard Logistics Management services include the retro-fit or factory installation of the on-board computer, DispPilot and the Logistics Management Service Package. Upon request, the Logistics Management Service Package can be integrated via the WebServices interface into the transport company s in-house software so that work can continue with familiar software. Communication in real-time with the vehicles is possible using the in-house application. 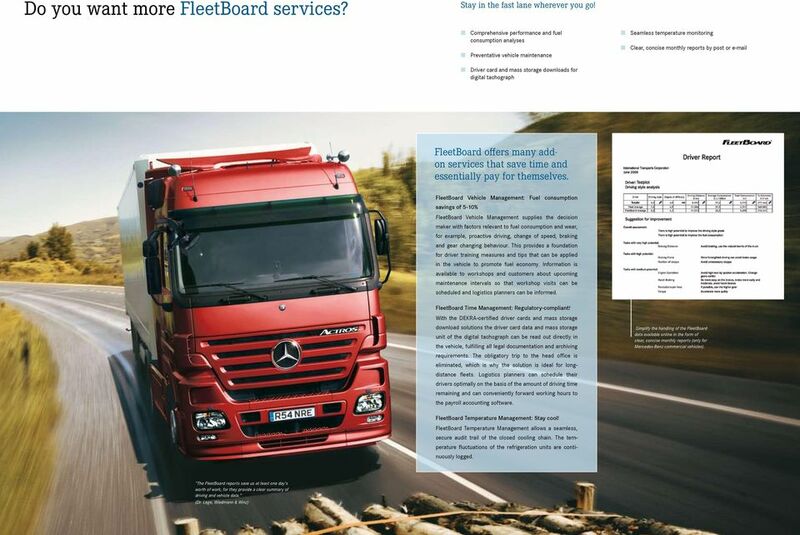 The FleetBoard vehicle computer provides a smooth exchange of information between vehicle and head office. Increase company profitability with FleetBoard Vehicle Management. FleetBoard Time Management Transparency from the first mile for optimal deployment planning. Lower consumption greater transparency for your bus fleet. A Daimler company. Lower consumption greater transparency for your bus fleet. A Daimler company. FleetBoard Time Management Full transparency of driving times. FleetBoard Vehicle Management Reduce consumption. Increase efficiency. For all brands. A Daimler company. FleetBoard Vehicle Management Reduce consumption. Increase efficiency. For all brands. A Daimler company. FleetBoard Logistics Management A New Dimension in Logistics. Cut fleet operating costs. Let your truck tell you how. TracKing. A complete web-enabled temperature management system. MAN TeleMatics. Your way to an efficient fleet. Scania Fleet Management. because details matter. Scania Fleet Management. Scania Services. Dedicated all the way. MAN TeleMatics. Your way to an efficient fleet. % 06 % 48 % 65. Man kann. % 16 % 16 % 88 SYSTEM. % 25 Downloading % 71 % 29. MAFIOK CONFERENCE SZOLNOK, 29-31 AUGUST 2011. TRACKING SYSTEM. Team Embedded Techlabs India Pvt. 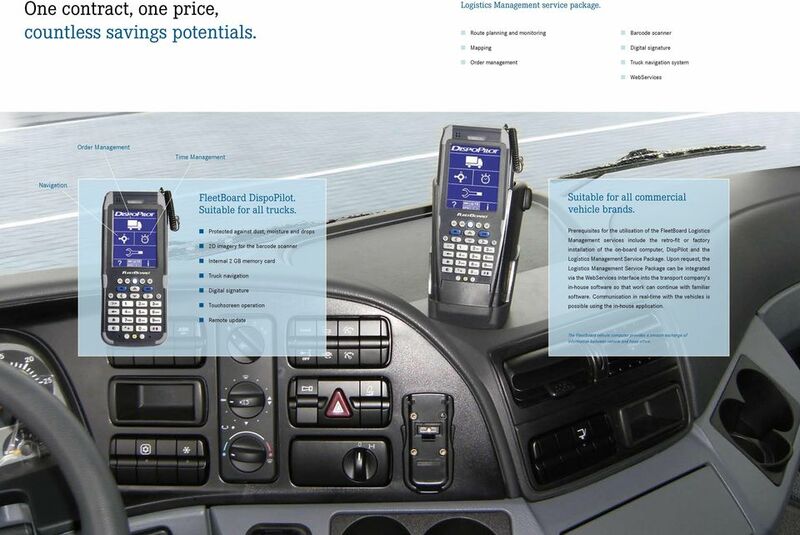 Ltd.
www.dtco.vdo.com For increased fleet efficiency Digital tachograph solutions and services Table of Contents Identify needs create market-driven solutions Being mobile means to keep moving with the times. Non-Stop Manufacturing Excellence. Automotive. Answers for industry. We help you run a more efficient fleet. is trademark of Mobiliz Information and Communication Technologies Inc. VEHICLE TRACKING. Equip your fleet with electronic driver logs and make FMCSA compliance effortless. SEE GREEN TO AVOID THE RED.